I love being able to recommend reference books, and this one is a delight. Those who liked the second edition of this book will be thrilled with this expanded third edition. If you’ve not seen any of the previous incarnations, you’re in for a treat. It's extremely well-organised, clear and easy to read. Further, it's absolutely packed with illustrations; these alone are worth the purchase. 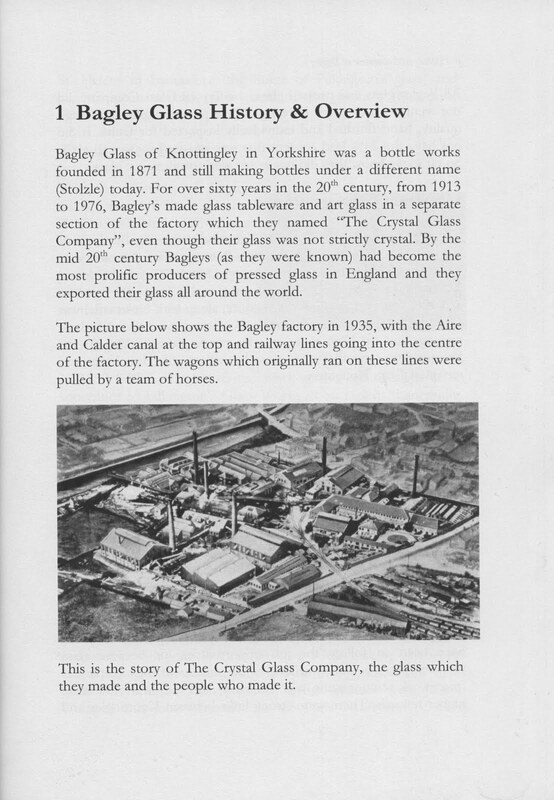 Since I'm a historian, I appreciate the opening chapter with a history of the factory and the founders. 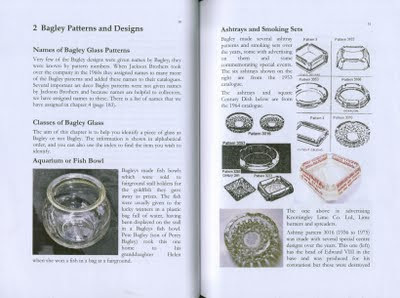 Of even greater value to the collector, of course, are the sections on identifying Bagley glass, organised alphabetically by type (Ashtrays, Celery vases) in the most helpful manner. Mrs Bowey includes named pieces, where these exist, although she explains that Bagley workers generally didn’t name items, referring to them by pattern number instead. 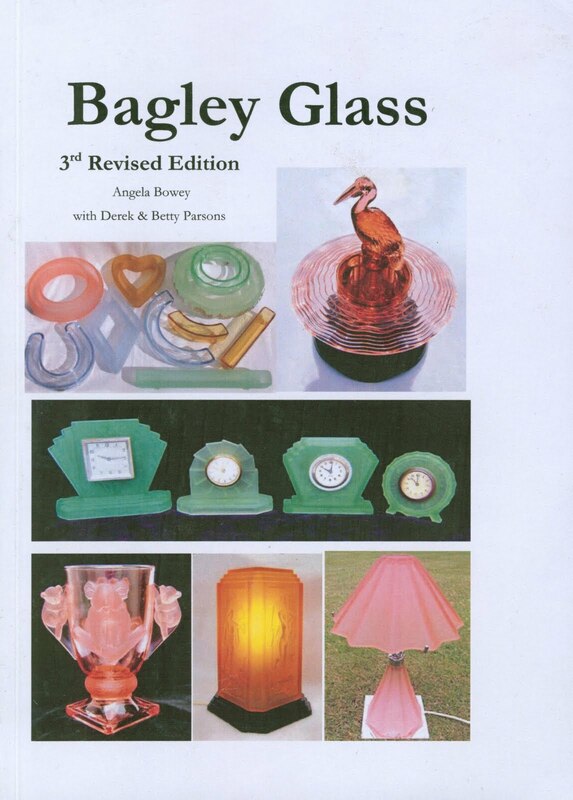 There is also information on decorations specific to Bagley, and a final section on Bagley Registered designs, trademarks and labels. A useful concept from the second edition that is expanded here is the comparison of similar products from other companies, i.e. 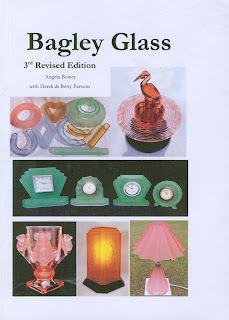 items that look like Bagley pieces but which were not produced by Bagley. The book closes with a comprehensive cross-reference index. Altogether a very worthy book, one that will make the sometimes onerous task of identifying British pressed glass much easier, and of invaluable use to collectors, hobbyist and professional alike. Note: You can find more information and order this book here. 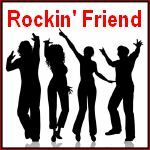 Aleta, I'm a new follower. Your blog is very informative and interesting. I am looking forward to returning and learning more! ps - I've already visited your website. Oh, what lovely things! Thank you, Donna, I appreciate your taking the time to leave a comment. My blog is still new, and I'm hoping to make it a major informational and entertainment resource for people who love art, antiques and collectibles. So far, so good. Kind comments like yours let me know I should keep trying! Thanks for stopping by, and for giving the link, which I'll post to the article.